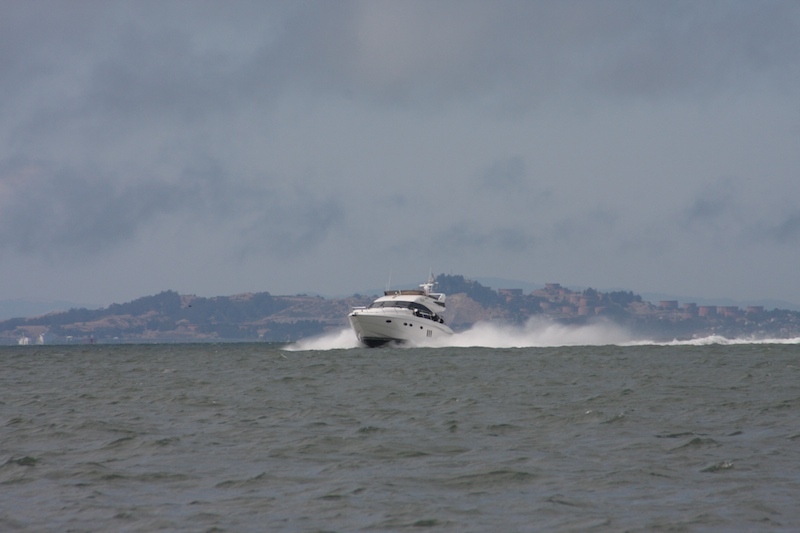 Last week, Jimmy and I decided to take out teeny tiny itty bitty boat into the Bay. 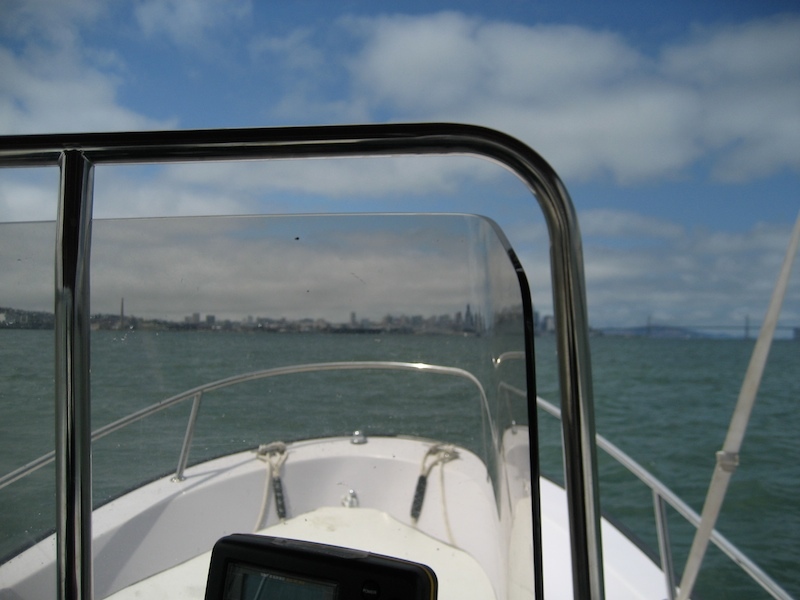 This was the first time we've taken our boat into the Bay because there are a whole lot of extra precautions required when you take a vessel into the big blue ocean. 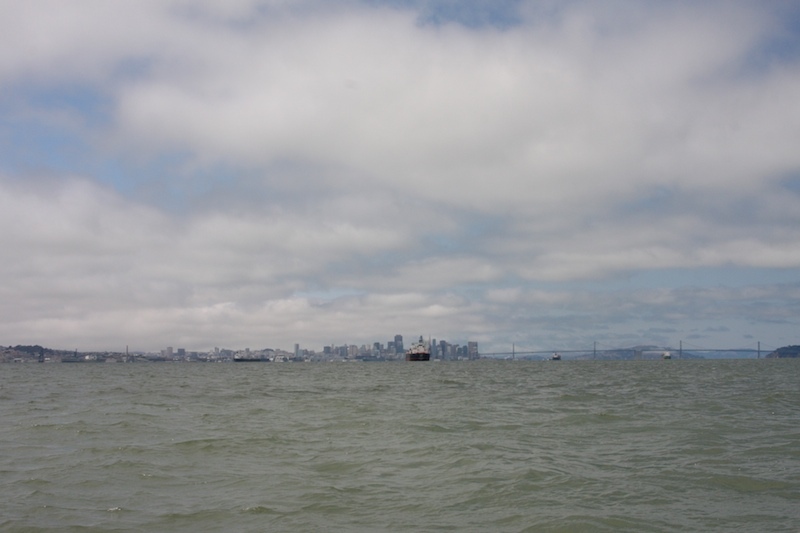 And essentially, the Bay is the ocean, especially in San Francisco. 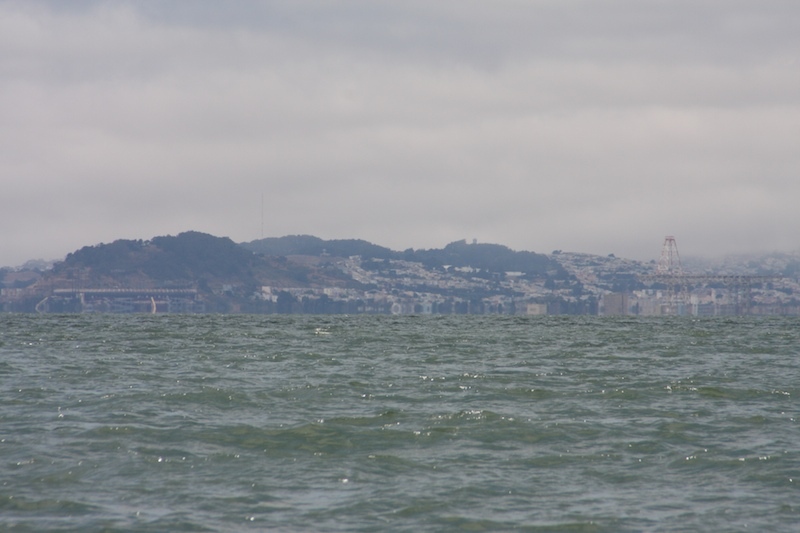 We launched the boat from the San Leandro Marina, which was a good 13-15 miles as the crow flies to San Francisco. In the the map below, it's the the starting and ending point on the bottom right. You may have to zoom out to see our full tracks. You'll notice with the bottom line, that we headed directly Northwest towards to San Francisco, moving diagonally across the Bay. It may not look very far, but in our teeny tiny itty bitty boat, it took us an hour to get across the choppy water. And the water may not look very choppy, but the boat was bouncing up and down like it was being dribbled by Michael Jordan. I've never really referred to our boat as itty bitty teeny tiny till this adventure. Because our 15' boat is perfectly sized for us and a few friends for our typical lake adventures near the hideaway. But being in that big body of water made us feel really itty bitty. 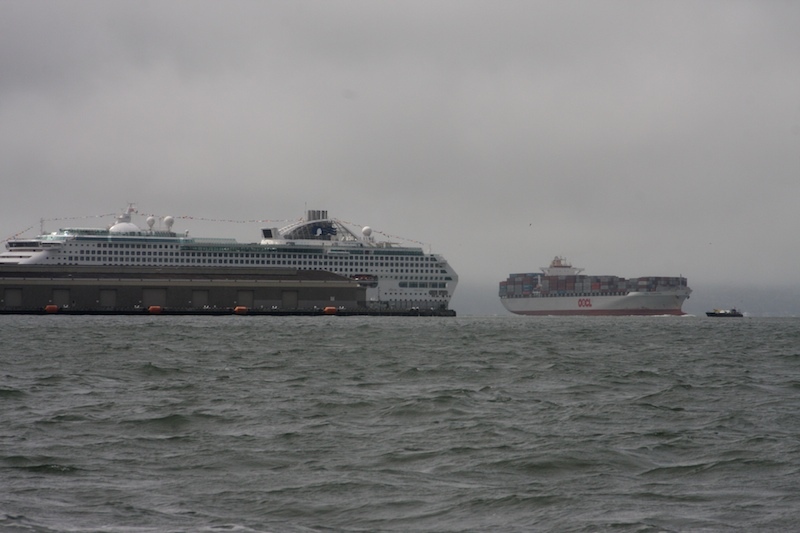 Especially when we got closer to the City and we went by the big shipping cargo vessels. I have to admit that during the hour it took us to get from San Leandro to the City, I was not having a good time. I was scared, cold and with each bang of the boat up and down against the waves, my back and neck felt like they were going to break. The waters felt so rough, I was afraid the motor would fall off. And illogically, I even envisioned the boat breaking in half, it was slamming down that hard. But when we finally made it across, I calmed down and enjoyed the views. We pulled into McCovey Cove and ate lunch. 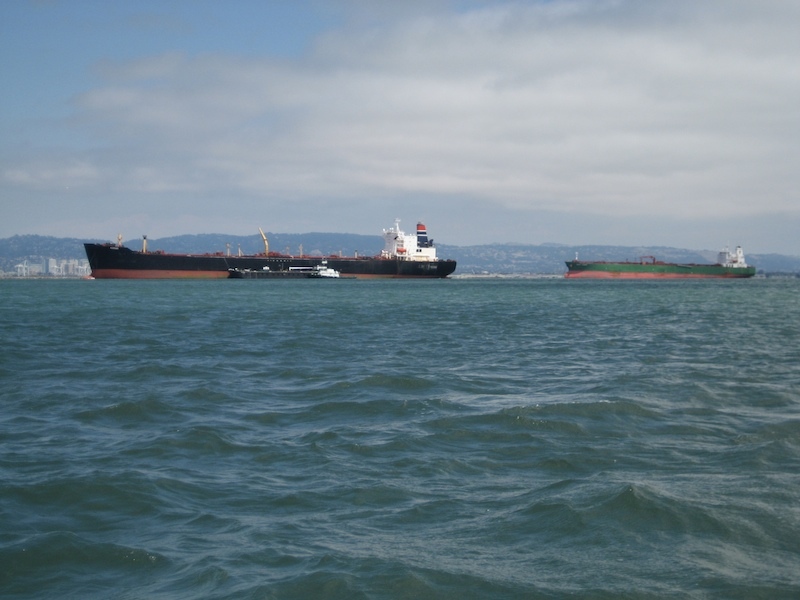 McCovey Cove is named after the Giants first baseman Willie McCovey and is the small water cove next to the Giants Stadium. During a game, non-motorized boats and kayaks gather here at the chance of scooping a home run ball. 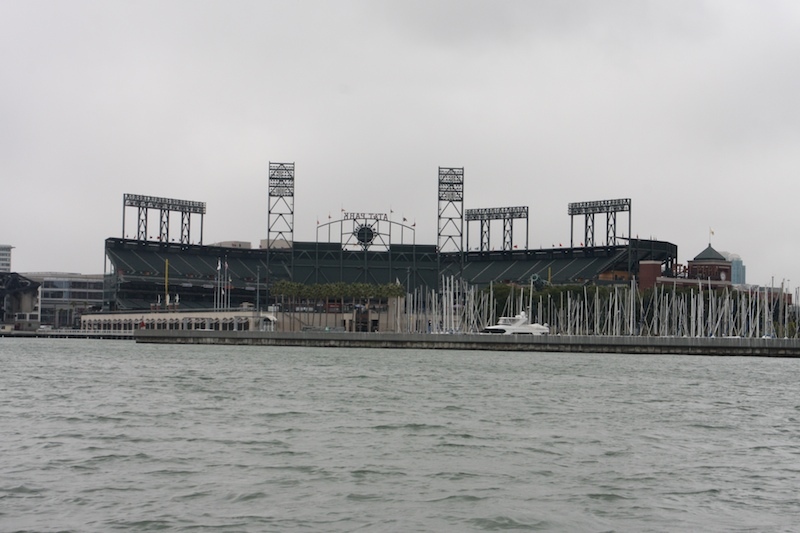 There have been a total of 49 "Splash Hits" into McCovey Cove since the ball park opened in 2000. After lunch, we puttered around the Bay a little bit. 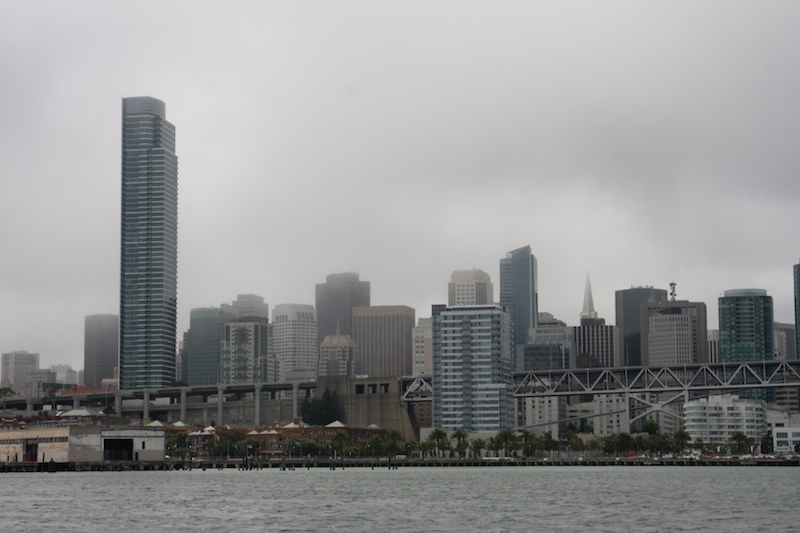 It was interesting looking at San Francisco from a different perspective. This is South Beach. 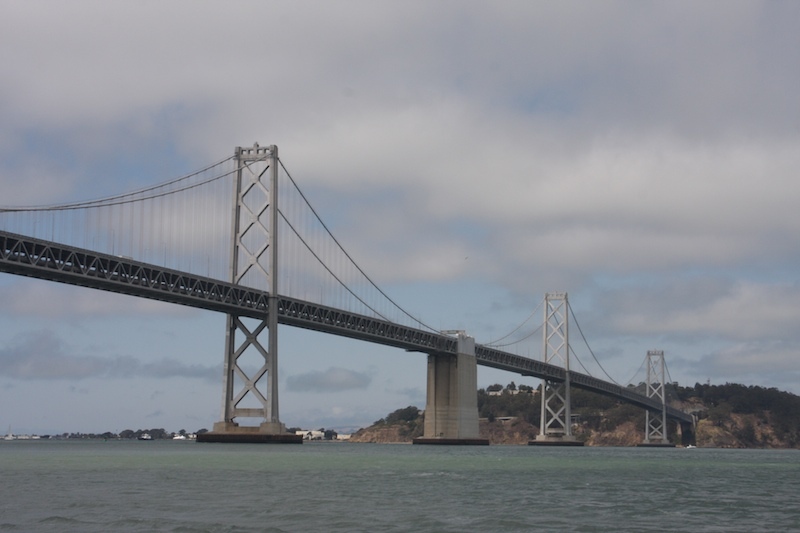 It follows up the Giants Stadium along the Embarcadero to the Bay Bridge. 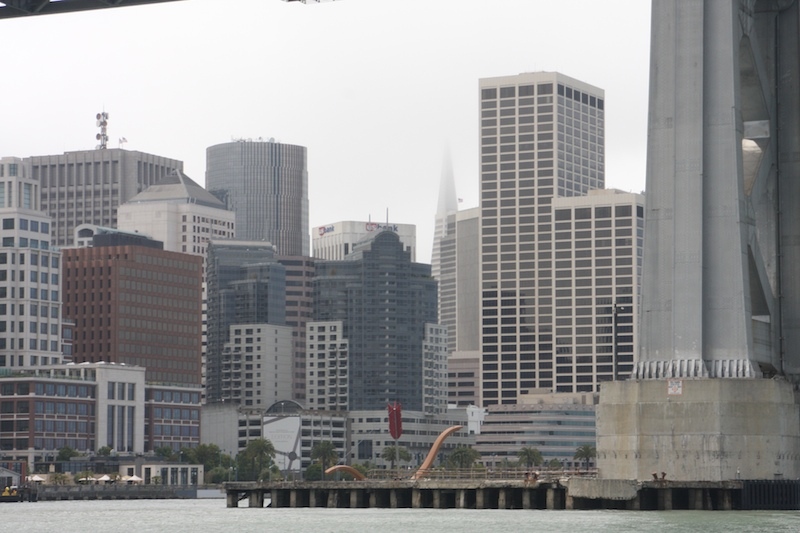 Here's a glimpse of the Downtown Financial Center as we're just about to go under the Bay Bridge. 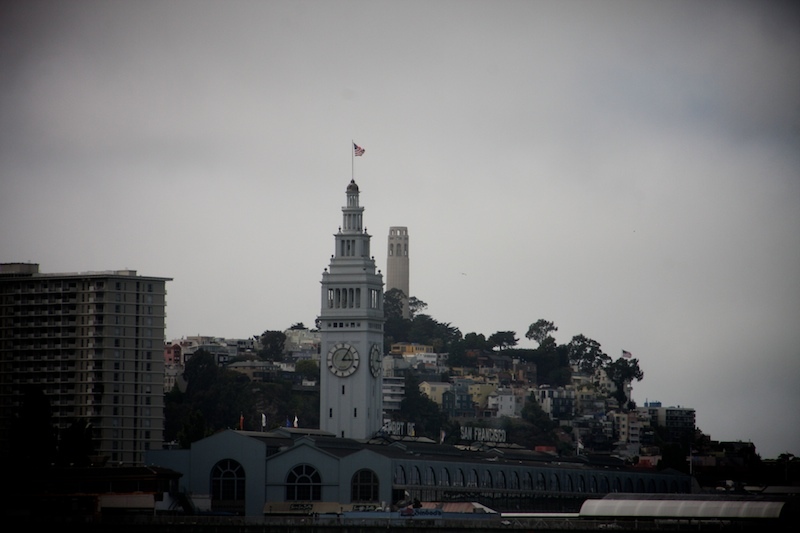 The Ferry Building welcoming us to The Port of San Francisco. Coit Tower in the background. 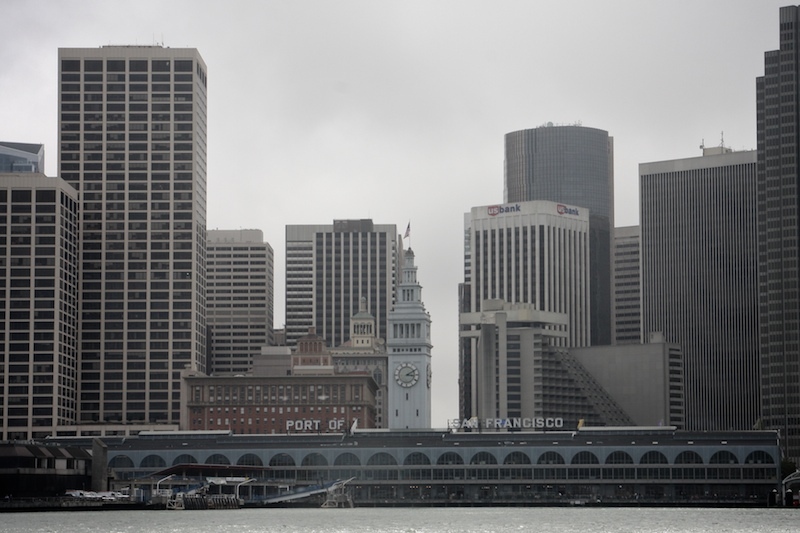 Another view of the Ferry Building and the Financial District. This guy wasn't messin' around. GET OUT OF HIS WAY!! Oh look! A big huge cruise ship, the Dawn Princess, was getting ready to leave for New York City via Mexico and the Panama Canal that afternoon. And another shipping vessel, probably from the Orient, just arriving. In the map, you'll notice that we barely went around the northern edge of San Francisco. That's because as soon as we rounded the bend, the winds got even worse. 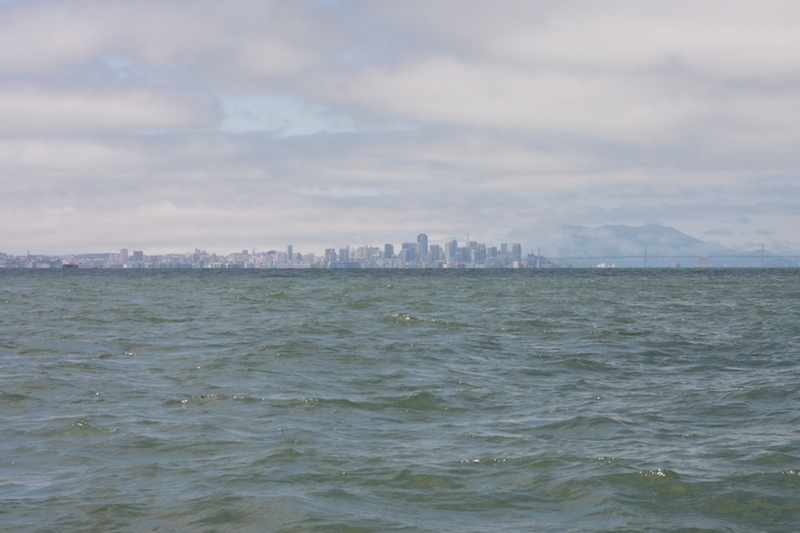 We originally wanted to go all the way out to the Golden Gate Bridge, but I knew we still had to go all the way back in that choppy water. I had to call a timeout and tell Jimmy that if we didn't turn back now, I wouldn't get home in one piece. 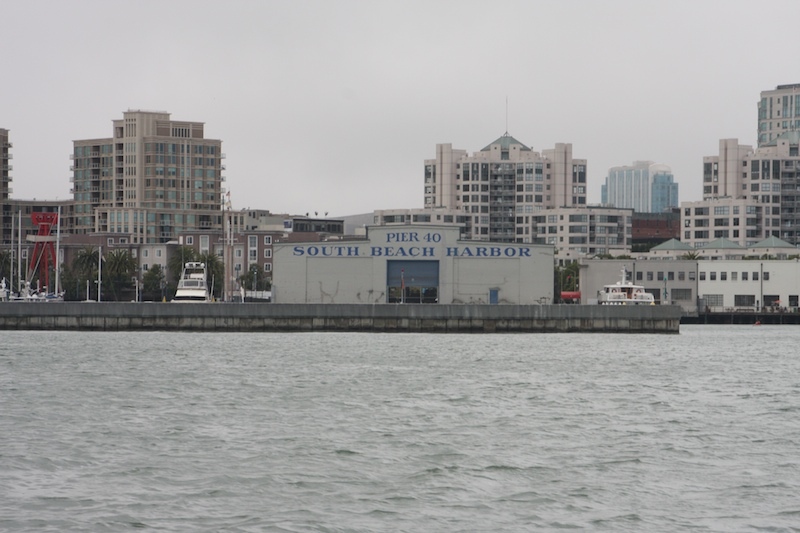 Don't get me wrong, I was loving the views and enjoyed seeing them from the water, but the weather, around 60 degrees, with the wind, just wasn't cooperating with me. 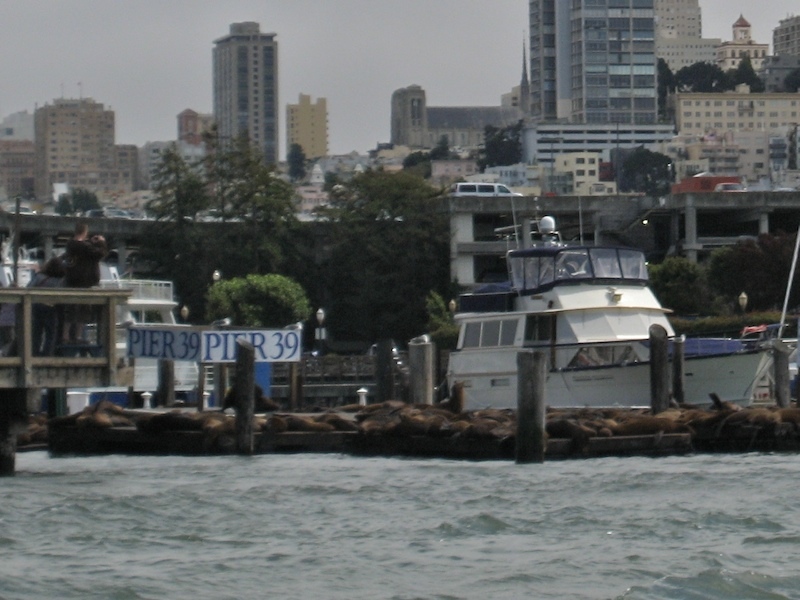 So we said quick hello and goodbye to the sea lions at Pier 39 and headed back, hoping that the wind would be at our back and push us gently back to the marina. I couldn't do that....never. I can't swim, would be so scared I'd be crying and screaming and....well, never woulda happened. Great photos, you are brave. did i tell you my grandson leaves for SF the 17th? That he is going to SF State? That we will be there the 17th of September? You obviously made it back safe-n-sound to post this entry, Mad! THANK GOD! I can imagine what that would feel like. You were able to get some great views in the process. Good for you! Oh, Mad, every time you post San Fran photos it makes me want to go back and spend more time exploring the city. So very, very cool. Sorry you got tossed around in the boat though.